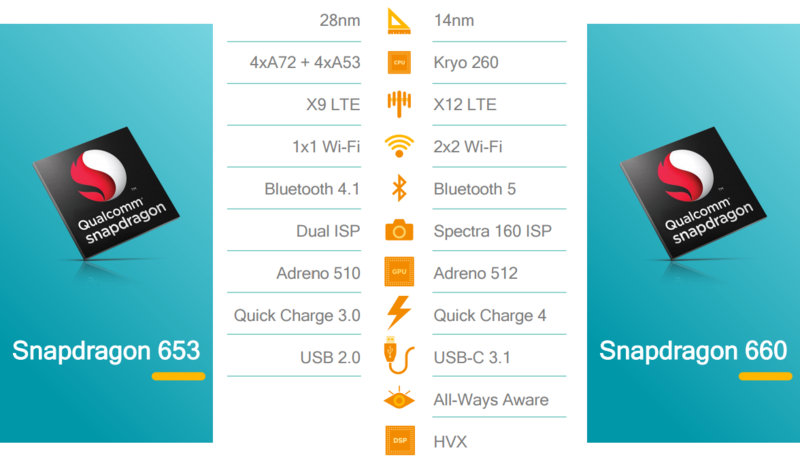 Both platforms will include new features like Bluetooth 5 support and the All-Ways Aware hub, which is a collection of low-power sensors tied to the rest of Qualcomm's platform and Hexagon DSP (wiki-hole, cool stuff). The latter is basically the low-power processor inside the platform that provides things like step counting, location tracking, and other background activities without killing battery life. It supports Google's Awareness API, a set of APIs for contextual actions. They both also include USB-C 3.1 support, a bump to Quick Charge 4, and the X12 LTE Modem which peaks at 600Mbps, as well as some new video chops via the Spectra 160 ISPs (this processes the raw data from the camera). The 660, in particular, brings some large changes. It's replacing the reference A72/A53 cores from the 653 with Qualcomm's Kryo 260 in-house design. I've been a big fan of the increased performance from Qualcomm's custom cores, and I hope that holds true with the 660. Qualcomm alleges that it sees 20% gains over the 650, so that would appear to be the case. It also has Dual Band Simultaneous 2x2 MIMO WiFi (read: fast). The Adreno 510 in the 653 has been tossed for the Adreno 512, with a supposed 30% increase in GPU performance. The consanguineous 630 won't see the same fancy new Kryo cores. It has eight ARM reference A53s, just like the model it replaces, but adds LPDDR4x support. Four of those are at 2.2GHz and four at 1.8GHz, with an advertised 10% bump in overall performance. It features the Adreno 508 GPU which has the same supposed 30% gains over the previous model, and the max resolution is also a bit higher than the 626 it is replacing, as it now supports up to QXGA (2048 x 1536). The best part for hardware makers is that both of these platforms are software and pin-compatible with the models they replace, so new devices should arrive that much more quickly. These specifications make the 660 look like a good contender, but the 630 is certainly no slouch, either. The 660 is available now and should be in devices arriving as soon as this quarter, while the 630 is not going to be available until the end of May, so expect to see it landing in phones sometime next quarter. The full text of Qualcomm's press release is available below. 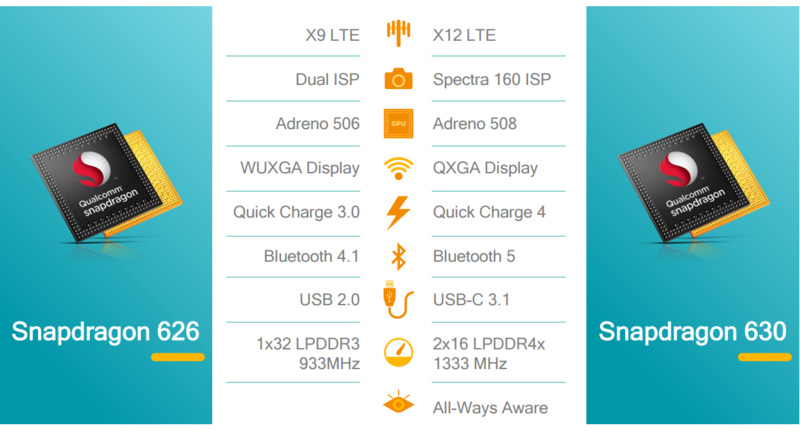 SAN DIEGO — May 8, 2017 — Qualcomm Incorporated (NASDAQ: QCOM) announced that its subsidiary, Qualcomm Technologies Inc., has introduced two new mobile platforms, the Qualcomm® Snapdragon™ 660 and 630, both designed to support a leap in performance enabling advanced photography and enhanced gaming, in addition to long battery life and fast LTE speeds. 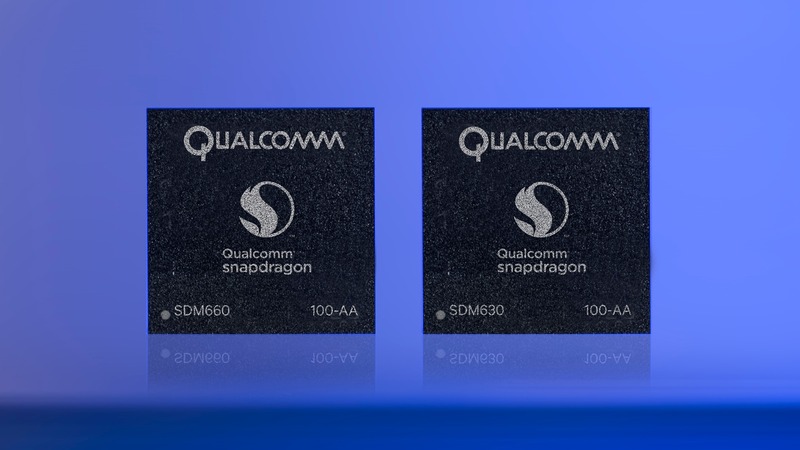 The Snapdragon 660 and 630 Mobile Platforms include the Snapdragon 660 and 630 SoCs, which encompass the baseband functionalities, plus software and hardware components including RF front end, integrated Wi-Fi, power management, audio codec and speaker amplifier, all to support a comprehensive mobile solution. Qualcomm's technologies powered the smartphone revolution and connected billions of people. We pioneered 3G and 4G – and now we are leading the way to 5G and a new era of intelligent, connected devices. Our products are revolutionizing industries, including automotive, computing, IoT, healthcare and data center, and are allowing millions of devices to connect with each other in ways never before imagined. Qualcomm Incorporated includes our licensing business, QTL, and the vast majority of our patent portfolio. Qualcomm Technologies, Inc., a subsidiary of Qualcomm Incorporated, operates, along with its subsidiaries, all of our engineering, research and development functions, and all of our products and services businesses, including, our QCT semiconductor business. For more information, visit Qualcomm’s website, blog, Twitter and Facebook pages. Qualcomm, Snapdragon, Hexagon, TruSignal, Kryo and Adreno are trademarks of Qualcomm Incorporated, registered in the United States and other countries. Qualcomm Spectra, Qualcomm AllWays Aware and Quick Charge are trademarks of Qualcomm Incorporated. Qualcomm Snapdragon, Qualcomm Spectra, Qualcomm Hexagon, Qualcomm All-Ways Aware, Qualcomm TruSignal, Qualcomm Kryo, Qualcomm Adreno, Qualcomm Quick Charge and Qualcomm Mobile Security are products of Qualcomm Technologies, Inc.